“However,” they added, “there are plans in hand for certain types of facilities such as moorings” which include, CRT say, three new elsans, 210m of new towpath mooring rings and 404 berths planned across 20 schemes, including 268 off-line berths. CRT has already made many improvements in 2016/17 including new mooring rings and facilities, dredging, additional rubbish bins and collection, and the creation of new long-term moorings, they say in a statement released earlier this week. Sorwar Ahmed, London boating manager at the Canal & River Trust, said that CRT had “listened” to boaters and were taking action. “We are working with other people, like local boroughs, social enterprises and boaters, to make these changes happen and improve London’s waterways for all our boaters and visitors. I’d like to thank everyone who’s got involved,” he added. · 125 new mooring rings providing over 700m of new or improved moorings. · New public water taps at Southall and Ponders End, and a tap opened up for public use in Paddington. · A new Elsan and pump-out in Alperton. · Dredging 2,250m of canal so boats can moor next to the bank more easily, including 2,000m in Southall, 200m in West Drayton and 50m in Hayes. · Three new refuse facilities on the Lee Navigation, with collection funded by the London Borough of Hackney. · New bins for boater rubbish in Greenford and an improved rubbish site at Cowley. · Logistical support for ‘Bins by Boat’, a pilot social enterprise project which offers boaters a floating refuse collection service. · 14 new long-term moorings, including three residential, in previously un-moorable spots at Matchmakers Wharf on the Lee Navigation, Atlip Road on the Grand Union, Burdett Road on the Limehouse Cut, and Bow Wharf on the Hertford Union. · Creating a new 7-day visitor mooring at King’s Cross. · Setting up two pre-bookable moorings at Rembrandt Gardens which charge a small fee for boaters who want to guarantee a spot in central London. · Working in partnership with the London Borough of Islington to secure Defra funding for public electricity charging points on the Regent’s Canal. 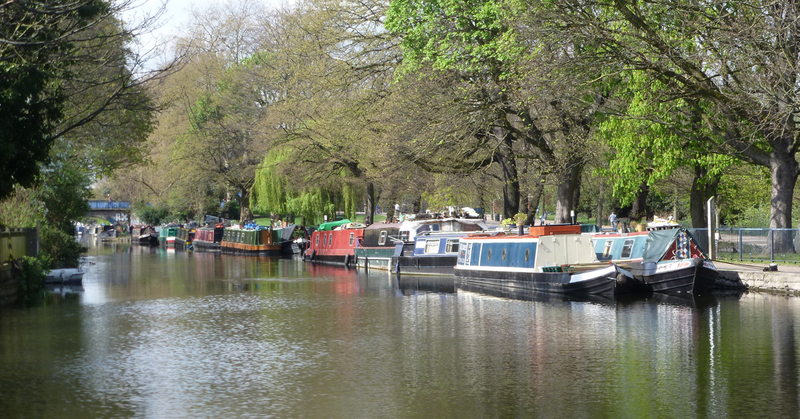 The CRT London Mooring Strategy was announced earlier this year and a focus group meeting was held last month and the initial CRT draft proposals were floated to a hand-picked group of canal stakeholders, user groups and related organisations. More permanent moorings in London where part of the draft proposals – but CRT warned that they would mostly be outside the popular central London area. CRT’s Boating Strategy and Engagement Manager Matt Symonds – who is also running the National boat licence review, which will also affect London boaters - has recently emailed boaters asking them if they would like to be considered for future London Mooring Strategy focus groups. The email includes a link to a short survey to register your interest - but no return email address. The LB News investigation into the nature of the promised permanent moorings continues.